Valeda's Hope is officially global. We went to South Africa for 3 weeks (November 28, 2017 to December 17, 2017) delivering hope, awareness, pearls and pencils to girls and women. Pearls to remind them that they are pretty regardless of what they may be facing and pencils as a reminder to tell and write your story. 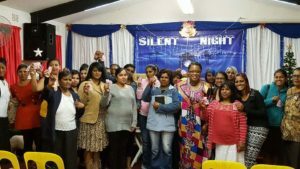 Valeda spoke at two churches while there — Bethesda Evangelical Church in Cape Town, South Africa, with Pastor Colin Van Wyk and Temple of Jerusalem in Durban, South Africa with Pastor Eugene Perumal. Valeda also purchased a recliner for the Phambili Community in Cape Town, South Africa. It will serve as a "community" recliner for the women to win while they recover and rest from a double mastectomy due to the diagnosis of breast cancer. Breast cancer is one of the leading cancers in women in South Africa. Valeda's Hope also gave "hope, pearls and pencils" to the victims and staff at the Hillcrest Aids Centre Trust (HACT) in Durban, South Africa. HACT is a multifaceted HIV/AIDS non-profit organization that serves all those impacted by HIV/AIDS by providing unconditional love and hope in a winning way. Along with offering awareness in South Africa, Valeda was able to visit some "must see" places: Bo-Kaap Museum, Robben Island, Kirstenbosch Botanical Gardens, Atlantic Ocean, Indian Ocean and of course the Safari. There is a water crisis in South Africa, which gave me a new perspective on the way I look at water. What a great way to end 2017 with Valeda's Hope. Go Global or Stay Local. Valeda's Hope will continue to win lives in a unique winning way.